The Edinburgh Tool Library wants your help! The organisation will be trialing their new Easy Sharing service, an online booking system that will see tools delivered to local community centres. They will be holding the testing session at the WHALE Arts Centre on Friday 1 March 2019, 12.30pm – 2.00pm, before and after the Foodness Community meal. We need lots of people to help make this happen so it can work for everyone, whether or not you normally use a computer or a smartphone. Come along, enjoy a tasty lunch and help shape the future of a potential new community tool library. 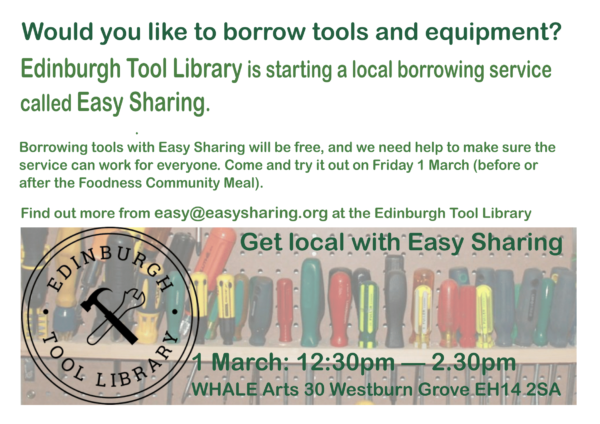 For more information contact easy@easysharing.org at the Edinburgh Tool Library.